Who has not woken up to a nice warm day, perfect for taking out the grills and have a fiery spur of outdoor cooking moments with the family? I mean, there’s just something about the blazing charcoal, the sizzling meat, and that tummy-growling smoke! You can throw a mean rack of sausages, chicken or ribs while you enjoy football on the weekends and get on with it or try something REAL— something entirely different than the common BBQ grilling. Your BBQ never tasted THIS GOOD! And smoking, my dear friend, is more of a labor of love and deliciousness. This slow process only means that whatever you are cooking not only takes in all the mouth-watering smoky flavors but also gives you succulent and tender meat that will make your stomach beg for more! Well, you will need to start looking for the best smoker grill in town! Do You Really Need a Smoker Grill? What Makes The Best Smoker Grill? AKA pipe smokers, horizontal smokers or offset barrel smokers, a smoker grill allow you to have serious control over the entire smoking process. This bad boy is the key to get a dreamy, tender, fall-off-the-bone meat with dark and crispy bark— yes, please! A smoker grill is specifically designed to smoke meats in a long and horizontal chamber and placed alongside the heat source instead of being directly above it. This design makes replenishing of fuel and heat adjustments much easier since you do not need to move the food out of the way just to add woods or coals to the heat source. Attached to one side, the firebox feeds smoke into the cooking chamber. And that smoke, my dear readers, is what gives the meat such melting tenderness, rich flavor and crunchy bark on the outside! The market offers 4 main types of smoker grills— each with its own pros and cons and offering of flavor. And if mouth-watering, tasty and fall-off-the-bone tender smoked meat is what you see, then charcoal is the best. With a charcoal smoker, you can produce such tender meats and explosive flavors and aroma that will seduce your neighbors, right away! Charcoal smoker grills do not require electricity and gas (obviously) but will require mastery of fire making using charcoals or briquettes in order to produce smoke and heat for your food. It takes practice to get better, but when mastered, the results will speak— or rather taste— for themselves. For the aspiring grilling master, cabinet style smoker is a perfect choice since they are well-insulated and produces top quality grilled meat. Off-set smokers, on the other hand, can be hit and miss. An absolute favorite of charcoal enthusiast is the drum or barrel smoker since they are easy to use, affordable and provide amazing smoky flavors! For the busy and lazy grillers, electric smokers are the best to have since they are easy to set up and start smoking with. It is the perfect tool for those who just want to plug in something and create genuine smoked meaty flavor, minus the hassle. The biggest perk of an electric smoker is, of course, the less worry of tending to the fire and never spending the whole day outdoors with it and instead spend time hanging with the family, watching movies or entertaining guests. This type of smoker is best for beginners and do not require much maintenance. You do need to add wood chips to produce the smoke and its flavor. But, you do not have to worry about dangerous gas and messy charcoal. Gas smokers use natural gas or propane in order to heat wood chips that are added to the smoker to produce the smoke. It is another type of smoker that is relatively easy to use and suitable for set-and-forget grilling style. Gas smokers offer similar flavors you get from other type of smokers, but with a better flavor than electric ones because of fuel combustion. Gas smokers also allow you to combine the level of effectiveness and affordability of producing great tasting BBQs. A favorite, pellet smokers help produce flavorful and juicy meals with a variety of meats and veggies. Because of its design, most models feature dedicated grilling options for versatility. Of all the types of smokers available, pellet smokers are recognized as the easiest to use. Some people even refer to this type of smoker as the “Cheater’s Smoker” since they are very easy to use, yet produce great flavors. All you will need to do is to select the cooking temperature and smoker will maintain the selected temperature with its temperature controller. Simple design, a pellet smoker requires you to feed wood pellets to the pellet hopper that goes through an auger, feeding a fire pot. The temperature controller will feed pellets as needed in order to maintain the temperature that you want. The flavor that pellet smokers offer is tasty and smooth. Although some people claim that it does not produce smoky flavors as strong as charcoal smokers can. But, you can solve that by just changing the pellets you feed. Smoker grills can be quite an investment, so I do understand the question. So, here X reason to convince you to buy a smoker grill. If yes, then smoker grill will provide you a better BBQ! Smoking preserves the genuine taste of the food your grill and you will not have any unnatural taste. Smoker grills are nothing more than a griller and smoker combined into one. BUT— it is a multifunctional piece of equipment that can serve the purpose of a griller, a smoker, a roaster and more, depending on the type and model you choose. I just said that they are relatively not cheap. So why budget-friendly? Up front, smokers can be expensive that regular grillers. But, in the long term, you will realize that having bought this grill and smoker combo has saved you a lot more money than buying single-purpose grilling equipment to complete your grilling set. Just think about the smoky flavor of your regular BBQ and imagine doubling— no— tripling that. Because of the smoky crust and slow penetration of heat, the nutrients of your food will be preserved. High heat is known to destroy the essential flavors and nutrients of the food you cook. Want meat that you can slice through with a spoon? Well, the long cooking hours and slow heat will turn even the toughest meat into a fall-off-from-the-bone texture. A big plus, smokers help preserve the juices of the meat and cases of long and struggled chewing on dry foods will be a thing of the past! You might say that you are an introvert and this thing does not apply to your lifestyle. But, trust me when I say, one of this day you will be throwing a party. And outdoor parties without an option for grilling and smoking? Well, you are rendering your party unentertaining there, bud. So avoid the disappointing looks from your guests and invest in one of these versatile beasts. The materials that a smoker grill is constructed from should play a big role in the price, quality, and longevity of the product. Stainless steel smoker grills may look impressive, however, if you are going to store and use the unit outside, then it will rust rather easily. Look for a smoker grill that has enameling or quality coat of paint so that it can last longer in such conditions. When looking for a smoker grill, the most important thing you need to decide is how much space you will need. These units are not one-size-fits-all. If you are regularly hosting a BBQ party then go for larger ones. But if you only grill for your family, then you can go with standard sizes. Getting a smoker with shelves under is quite handy. It offers you the convenience to store firelighters, tongs, spare charcoals, grill brush, covers and other tools you need when cooking. Having a secondary cooking rack can offer you an extra cooking space and on some units, you get at least 40 percent more cooking space. This feature is extremely important with pellet and charcoal smokers, but, with gas and electric smokers, this will depend on what you are cooking. Are you going to grill in one spot of your backyard? Or maybe you have a wide backyard where you can move your smoker around depending on the weather or where you wish to cook? Do usually go fishing and camping and would like to take your grilling with you? You can get various models of smoker grill which come on stands, poles, wheels and even some which have adapters in order to fit the back of your car. Like any kitchen tools, it is important that you keep your grill tidy and clean. This should produce better food and extend the life of the unit. Cleaning a smoker grill can be difficult if you do not keep on top of it. But, you can find smoker grills wit easy cleaning features in order to make things easier for you. Due to innovation and advancement of technology today, you will find smoker grill models that do more than just cooking grate over a wood fire. Now, smoker grills come in features like multiple temperature gauges, automatic feeders, remote control, and even Wi-Fi enabled! However, think about what you really need before getting “Wowed” by all the fancy features out there. When buying smoker grills, you will need to consider the fuel you want to use. I have already explained to you the different types of smoker grills in the market today. If you want authentic smoky flavors, charcoal smoker is the best. But if you want something easy and still offer you the heavenly flavor of smoking then pellet smokers, gas smokers, and electric smokers are your best bet. The Z Grills Wood Pellet Grill and Smoker is an 8-in-1 smoker grill that should accommodate any cooking techniques you want— be it braising, searing, char-grilling, roasting, baking, smoking, grilling, and barbecue. 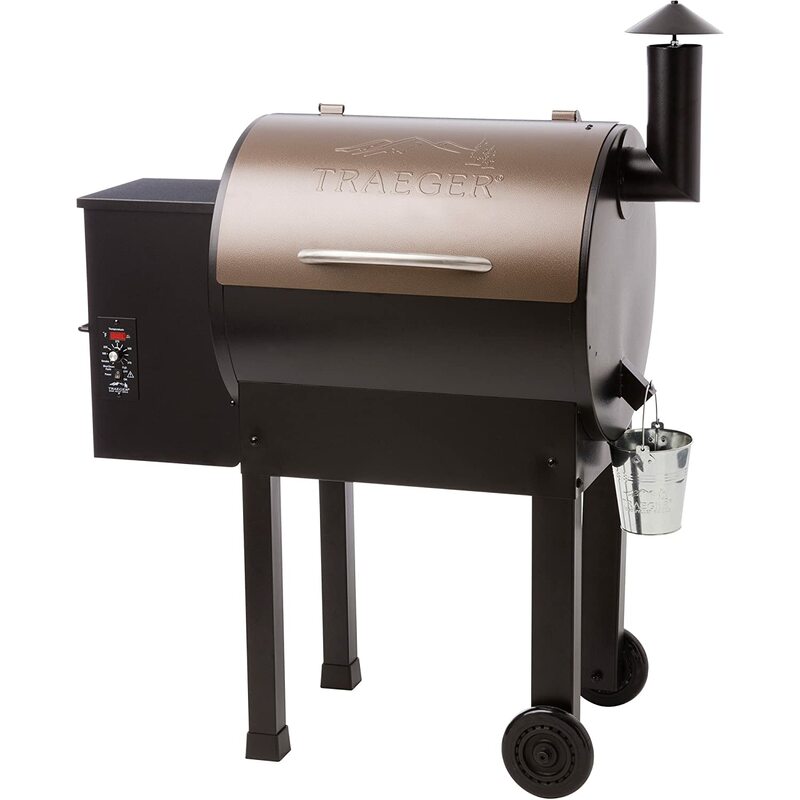 Made from stainless steel, this smoker is highly resistant to corrosion and boasts a polished and sleek finish. Plus, it comes with an extra wide grilling space so you can throw all your meats in one go. It eliminates the need for a rotisserie thanks to its fan-forced convection cooking, so you can grill, bake, braise and roast to your heart’s content. The unit features an upgraded temperature setting allowing you to set cooking temperatures from 180°F – 475°F as well as an upgraded pellet feed control system which about ignites the smoker grill. 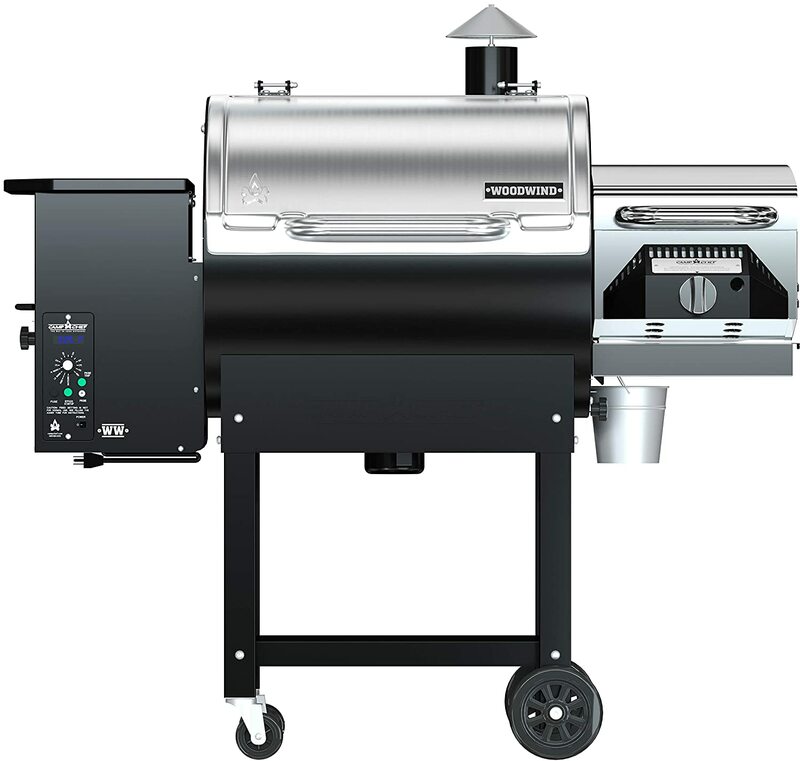 Featuring an automated electric feed system, this smoker will maintain the heat for you and produce an optimal amount of smoke so you can go and have fun while it cooks. The smoker also comes with useful features such as LED temperature readout, Digital Auto Temperature Control, and Electronic AUTO-start Ignition, making things easier for you. The upgraded cart with locking caster wheels makes the unit easy to move and the Special Waste Oil Collector assist in easy and safe cleanup. Every grill lover’s dream fulfilled— enjoy quick gas grilling on weekdays and slow charcoal cooking on the weekends with the Char-Griller Duo Gas and Charcoal Grill. 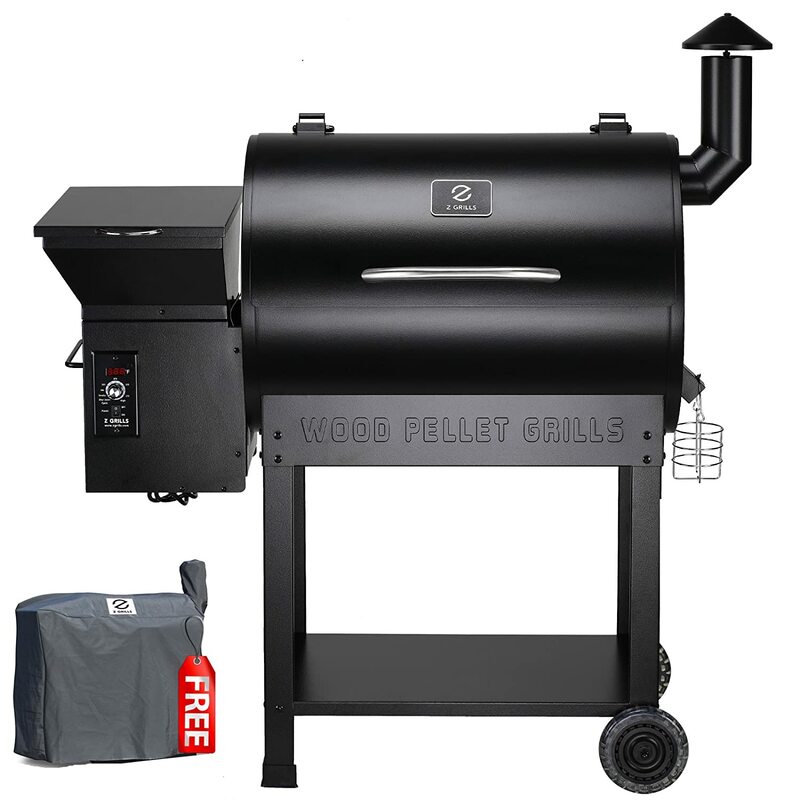 Offering 1,260 square inches of smoking and BBQ grilling space, this smoker grill comes with heavy steel construction for durability and sturdiness. 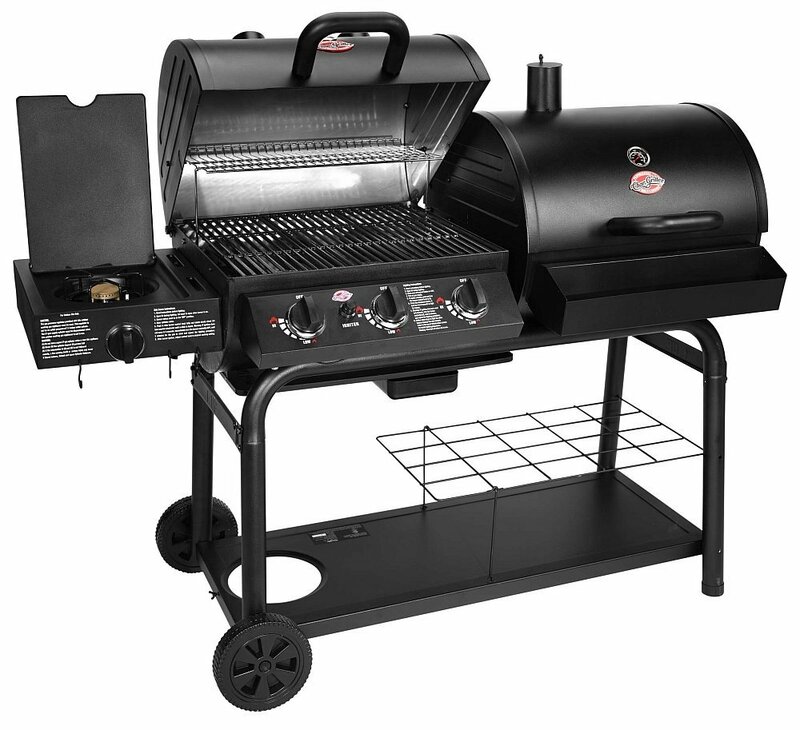 Charcoal for flavor, gas for convenience, it comes with warming racks and a cast side burner for extra cooking capacity. Featuring porcelain-coated cast-iron grates, it provides an easy to clean surface and superior heat retention. The grille comes with electronic ignition so you can start grilling with just a push of a button. Also, it has an adjustable charcoal grate height that provides precise heat control for a hot or low and slow sear. This grate also doubles as a quick dump ash pan for a mess-free cleanup. Its double bottom construction insulates and improves efficiency when you are cooking with charcoal. An include grate lifter also make your life a bit easier when adding new charcoal. Lastly, the smoker boasts plenty of storage with condiment basket and underneath shelf as well as movability with the added wheels. Craft awesome wood-fired creations with the Lil Tex Elite Smoker Grill from Traeger. From smoked ribs to grilled steak and even baked apple pie, its set-and-forget design allows even the busiest chefs to cook with ease. Featuring an aesthetic appeal of Victorian Steampunk vibe, the Lil Tex will surely be the center stage of your backyard cookout. And although named “Lil Tex”, do not belittle this beast with an offering of 418 square inches of grilling area— comfortably fit up to 5 racks of ribs, 24 hotdogs, 4 whole chicken or 16 burgers in one go! Never use charcoal or gas ever again, this one is a pellet smoker, so your food will get infused with that wood-fired flavor that you love. Low and slow or hot and fast, this smoker grill offers 6-in-1 versatility to braise, roast, bake, smoke, grill, and BBQ food to juicy and yummy perfection. And you do not need to deal with fire starters anymore, with a simple flip, this smoker grill is hot and ready to go! Its porcelain grill grates feature non-stick surface for easy cleaning. Is budget an issue? Then consider this Woodwind Classic Pellet Grill from Camp Chef. This smoker serves the budget purpose and is large enough for big-sized BBQ parties with 570 square inches of grilling space. Truly worth every penny! This smoker comes with a sear box and a broad range of temperatures choices from 160°F - 500°F as well as a 900°F for the sear box. 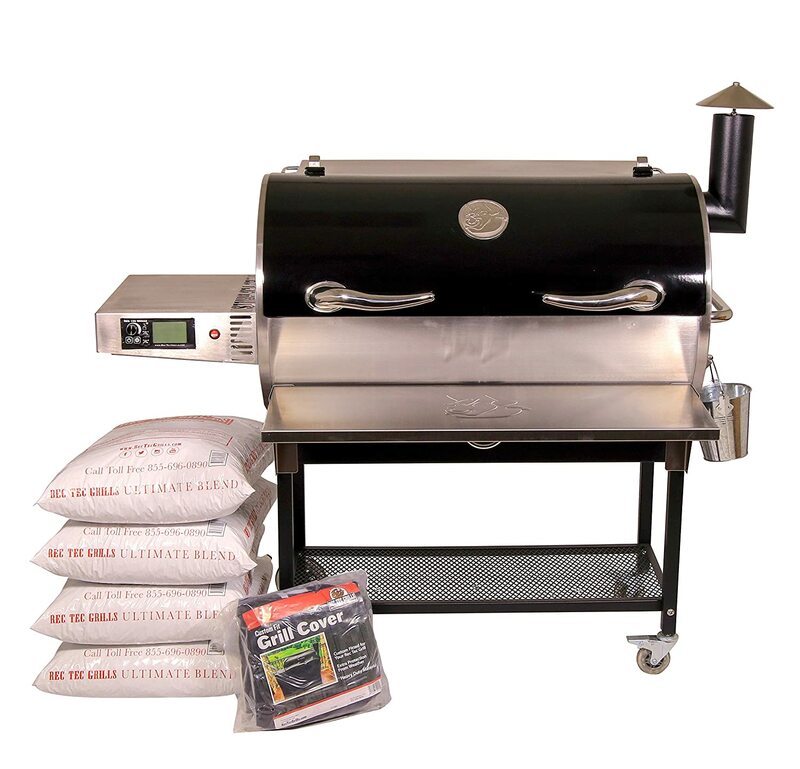 Featuring Smart Smoke Technology, temperature control, and automatic auger fee pellet to the grill in order to maintain the heat and produce an optimal amount of smoke. Braise, roast, bake, smoke, grill, and barbecue all you want with a touch of wood-fired flavor on every grill. When you’re done, its Patented Ash Cleanout makes cleaning so easy all you need to do is to pull a lever. You can do some great grilling with this bad boy, but where it really shines it its smoking ability! The best just got better when REC TEC introduces the “Bull”, forever changing your grilling game! The Bull provides the same quality components and precision craftsmanship that Rec Tec fans have grown accustomed to but with several innovative features and upgraded offering that will blow your mind! Featuring a cooking chamber made of stainless steel, you do not need to worry about peeling or cracking. For the geeky cooks, the included Wi-Pellet Wi-Fi technology will surely catch their attention. This feature allows you to fully control your cooking from anywhere using the Rec Tec Grills App which is available in both Google Play Store and App Store. Not only that, but this smoker also boasts dual meat-probes which can be plugged directly into the controller of the grill, so you will no longer need a cooking thermometer for monitoring. With the Temperature Controls Smart Grill Technology, the bull maintains the temperature precisely and with the Automatic Lighting feature, you will not need any unsafe fire starters to start grilling. Lastly, this smoker can also shut down automatically and enters in a cool down mode with just a push of a button. The Char-Griller Gas and Charcoal Grill! Although we have some pretty competitive models, nothing will beat a genuine charcoal smoked meat. And if you ran out of charcoal or maybe in a hurry, you can quickly grill up something with gas grilling. But if you want something easy, then I suggest you go with Rec Tec Grills RT-700 Bull Portable Wood Pellet Grill. Its innovative and techy features will certainly provide you with all the convenience you need. Producing nutritional, great-tasting and tender-juicy meat has never been this easy. The smoker grill might sound like a façade to most people, but this baby is a blessing and a beast all in one, satisfying all your grilling and roasting and barbecue needs! Are you curious about something? Maybe itching to share some knowledge? Feel free to voice it up and hit the comment section below. Until then, happy smoky grilling! PreviousPrevious post:Missing a Drop of Peanut Oil? Here are 9 Worthy Peanut Oil Substitutes!